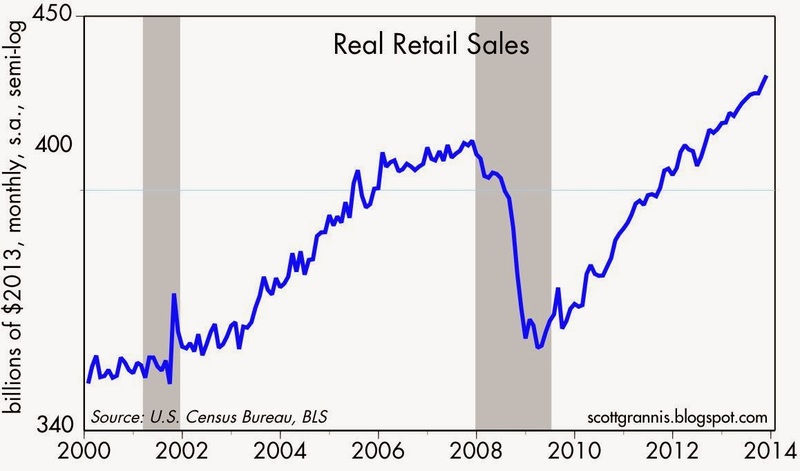 November retail sales were a bit stronger than expected (+.7% vs. +.6%), but the overall picture of retail sales was unchanged. 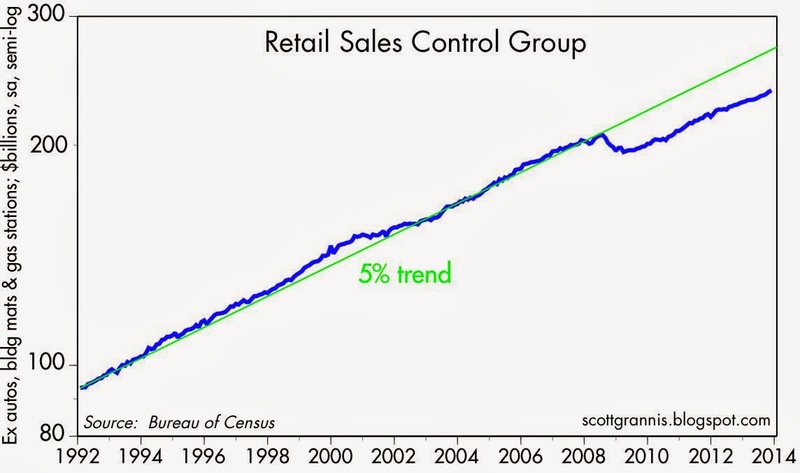 What we have seen in recent years is retail sales growth of about 4% per year, and today's report didn't change that. 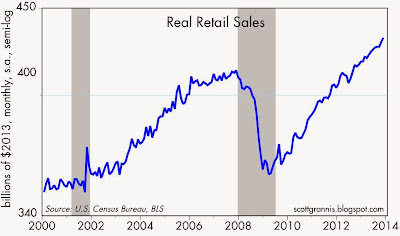 If anything, it is significant that retail sales growth has not declined this year given the end of the payroll tax holiday and the rise in some marginal tax rates. 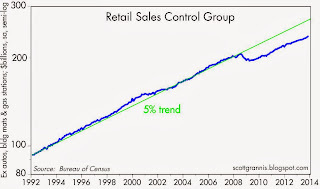 Adjusted for inflation, retail sales have been increasing steadily for almost 18 months. If we take out the volatile sectors (building materials, autos, gas stations), the chart above illustrates exactly why this has been the weakest recovery ever. Although sales are growing at close to their typical pace, there is currently a shortfall of about 12% relative to the long-term trend. This is directly attributable to the fact that there are upwards of 10 million people who have left the workforce since 2008. In effect, we've taken almost 10% of the economy's productive capacity (its workers) and sidelined it, so overall output is about 10% less than what it could have been if they were all working. The key to a stronger recovery lies in figuring out how to get these people to return to the workforce. One thing is now clear: higher taxes, more government spending, more emergency employment benefits, and more income redistribution are not going to do the job. We need policies that encourage risk-taking and work; policies that increase the after-tax rewards to risk-taking and work, not policies that reward caution and leisure.